At Walkerhill's Outdoor Pool "River Park"
There are people who run away from heat, and there are those who defeat it. Take control of the heat and go on an exciting vacation without having to board a plane. This summer, swim in Walkerhill's new and improved outdoor pool River Park, savor authentic Bali cuisine, lose yourself to tropical Bali gamelan music and fall into a trance to the flying vivid hues of Balinese costumes at Walkerhill River Park's "Bali Festival" July 20 to August 18, 2007. For the best experience this summer has to offer, the Bali Culture Team is visiting Seoul to bring entertainment and authentic food to those who have yet to be exposed to Balinese culture. Walkerhill brings an exotic paradise getaway to your doorstep. Professional Balinese dancers will tell epics and myths to enlighten the Korean audience and quality chefs will prepare a mouth-watering menu for a true "taste of Bali." Chefs from two of Bali's deluxe hotels will prepare an authentic Balinese buffet consisting of appetizers, soups, entrees, snacks, and desserts for a wide variety of tastes to suit everyone's preferences. Traditional food such as satay, beef with cassava leaf, spring chicken and banana leaf wraps, and even desserts like sticky rice balls in palm sugar sauce, deep-fried banana with vanilla ice cream, and more, will be buffet-style for everyone to have the opportunity to satiate each taste bud. For the perfect visual entertainment to accompany the delight in your mouth, Balinese dance performances will be held four times a day – each performance varying slightly in narrative and mood. 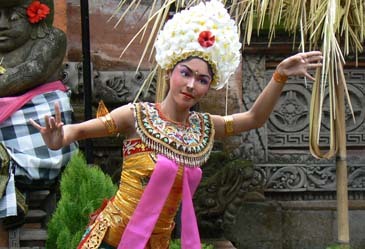 Classic dances such as the Legong, Baris, and more, will be introduced by the Bali Culture Team's highly qualified professional dancers who have more than just experience in Balinese dancing, but have originality, understanding, and perspective about the movements and expressions of the story within. This expression, distinctively flavored by Balinese ethnicity can only be seen at River Park for a limited time. It's the perfect opportunity for the entire family to enjoy a quick, yet revitalizing and efficient vacation to Bali.